I'm super excited about this week's list, as I am completely smitten with Jenna's blog (her photography is fantastic, her taste impeccable) and am a huge fan of Whimsy and Spice, the Brooklyn-based confectioners that Jenna and her husband are behind. With her aesthetic and design sensibility and her husband's culinary prowess, they elevate baked goods and homemade marshmallows into little pieces of art. So lovely + cool. So, yes, her list rocks! Without further ado, Jenna's favorites. Enjoy! 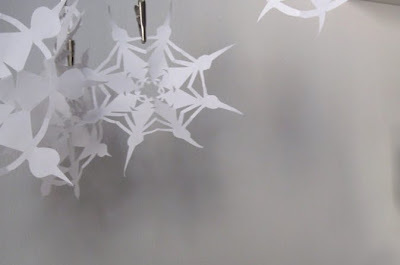 Paper Snowflakes -- Every winter I make a dozen or so paper snowflakes cut from regular white printer paper. Now that my girls are a bit older, they have joined in on the yearly ritual. We hang them around the house during the holidays and in a couple of years, if we keep it up, we’ll have enough to paper the whole house with snowflakes. 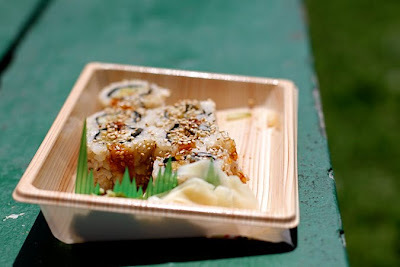 Sushi -- It's my favorite food. I love the presentation, the freshness, the colors and most everything about it. Even though I discovered the hard way that I can’t eat it everyday (I tried! I tried real hard! ), I can most definitely eat it a few times a week given the chance. The hardest thing about being pregnant? Not being able to eat sushi. In fact, the very first thing that I did after I got out of the hospital from having a miscarriage in between my 2 kids was order sushi from the car on the drive home. Lavender Fields -- I went to my first just a few weeks ago on the North Fork in Long Island. 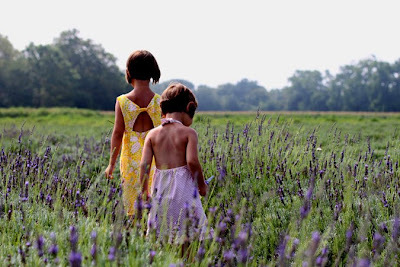 Lavender has always been one of my favorite scents and the smell standing in that field was heavenly – I had never been surrounded by that much lavender before. I can still imagine how intoxicating the scent was on that hot day when I look at these photos. 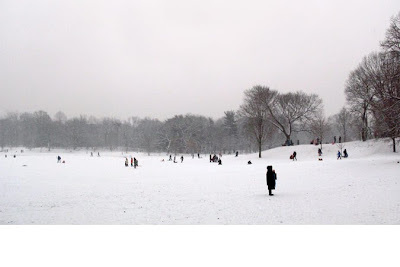 Sledding in Prospect Park, Brooklyn -- I love how quiet the city becomes during a big winter snowstorm. No cars, no noise, just white blankets of snow. We’ll often drag the sled up to Prospect Park and join the throngs of other neighborhood people to play and sled in the snow. Standing in that big meadow without any city buildings in sight, with the snowfall blurring the lines between sky and ground, makes you feel like you're transported to some winter fairyland. 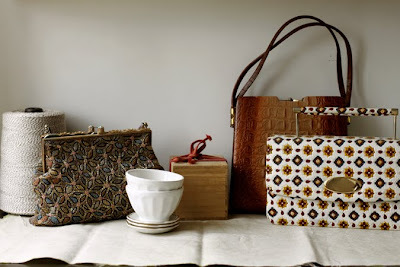 My Mother’s Vintage Handbags -- At some point when I left home for college, my mother allowed me to take her old handbags with me. They are probably around 40 years old and I like to display them around the house. It reminds me of when I used to take them as a kid to play fancy dress up. I loved them then and I love them even more now. Taking Photos -- I know photography has been a favorite topic for many guest bloggers here, but I had to include it because despite the fact that I work as a freelance art director and designer, photography is increasingly becoming my most satisfying creative outlet these days. My interest in taking photos actually grew in earnest when we started our business. We didn't have a budget for photos so we decided to do it ourselves. I didn’t realize just how much I would end up loving it. My camera usually goes with me wherever I go and I try and take photos everyday, most of which end up on our blog. I love this list! 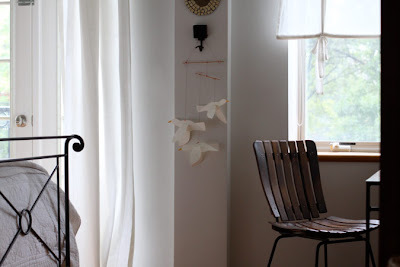 I discovered Jenna's blog a few weeks ago and got so hooked on her beautiful pictures and wonderful writing that I compulsively read back through every entry over the course of a weekend. Jenna's great...and this list is every bit as wonderful as she is! you can't have sushi when you're pregnant? thanks for the profile. 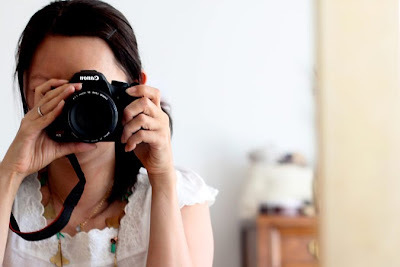 I adore Whimsy and Spice goodies and her photography on her blog is amazing! I adore the chair in the top photo. Everything looks so serene!